VUE Audiotechnik has unveiled the latest addition to its popular al-Class line array family, the new al-4-sb Flyable Isobaric Subwoofer. 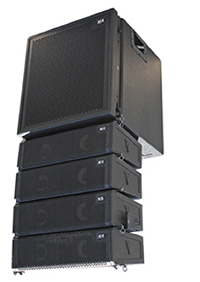 Designed specifically for seamless integration with the al-4 Subcompact Line Array System, the highly versatile al-4-sb features rigging options for suspension above or behind al-4 line arrays in a variety of configurations. VUE even offers a flyable end fire grid that allows quick assembly of sophisticated al-4-sb end fire arrays for improved directionality and reduced low frequency energy on stage. The al-4-sb is equally adept in portable applications. The compact and durable birch enclosure features recessed handles and skids for easy transport and stacking. Integrated rigging allows quick assembly of ground-stacked arrays, while a 20 mm socket accommodates up to four al-4 acoustic elements on a pole with the optional U-bracket. At the heart of the al-4-sb are two precision-engineered, long-excursion 15-inch transducers that feature neodymium magnets and large 4-inch (100 mm) diameter voice coils for high power handling and reduced power compression. The transducers are placed in a front-to-front, isobaric configuration. The unique isobaric alignment delivers less distortion from an enclosure that is dramatically smaller than more conventional dual 15-inch designs. For ultimate low frequency performance, the al-4-sb should be used with VUE Audiotechnik's V4 or V6 Systems Engines. DSP profiles are available for a wide variety of al-4-sb configurations. V Series amplification provides power for as many as four al-4-sb subwoofers with the V4, and up to eight with the V6. When fully optimized the al-4-sb will easily deliver powerful and well-defined low frequency reproduction down to 45 Hz. The al-4-sb can also be used along with additional ground-stacked VUE subwoofers to further extend low frequency response and increase overall system output.